The family took advantage of some dry single track and milder temperatures up in Smithville today. We all really like the trails up there and usually have a very fun ride. I know the trails like the back of my hand and at times I seem to push the pace and ride on the edge because I feel so comfortable out on the trails. Today I went over that edge. Things started off a little slow for me today, maybe my age is starting to show. Christopher on the other hand was out of the gate and attacking Lakeside Speedway like it was a race. His new Anthem 29er was just floating over the rocky sections of this part of the trail. He actually had to wait up for me a couple of times. Once we got through Neal's we took the pavement back up to join into Posson Trot (basically we were running the old Bone Bender course). By then I was really warmed up and passed Christopher and started to pace us. I wanted to do a tempo ride anyway. Once we crossed the paved trail and bombed down to the creek bed Christopher got a stick in his rear wheel and had to stop. I continued on and actually picked up the pace because I really enjoy this part of Posson Trot. Well, I guess I got carried away and ended up going down really hard and hitting my head. I do not remember everything, but I do remember wheeling over the large log and beginning to lift my rear tire over to clear it. I guess I started pedaling a little too soon and clipped the log which catapulted me into the air and over the bars. I hit the right side of my head really hard. I have a nice big dent in my Rudy Project helmet to prove it. 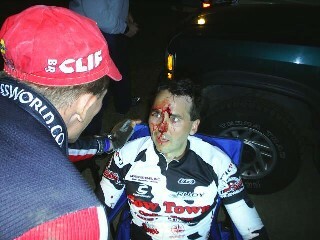 Luckily the helmet did its job and protected me from serious injury, but I was unconscious for about 20 to 30 seconds. I think the last time I broke a helmet and was knocked out was during the Branch Oak 12 Hour Mountain Bike race up in Nebraska. You can see the results from that crash below. Back to today. Christopher catches up to me after he removed the stick from his wheel set. When he gets to me I am laying flat out on the ground. He thinks I am playing around and asked if I was "Taking a break" I am starting to come to at that point and slowly get up and check to see if I have any serious injuries. I did not, but what if I did. I asked Christopher what would he have done if I did not get up. He said he did not know. He would most likely move me to the side of the trail and then go get help. What if I had a broken neck I said? What do you do? Heck, I do not know either. It has been many, many years since I attended any CPR/First Aid training. As I started to feel a little better we continued on with the ride. We met up with Shane and Cliff and stopped for a few minutes. Cliff asked me if my eyes where dilated. Cliff is a Trail Patrol member so he knows a thing or two about first aid. After we left them I decided that I was going to become a Trail Patrol member this year. With some of the stuff we do I need to be able to handle emergency situations and be able to administer first aid to a fallen rider, especially if that fallen ride happens to be a family member. The family took a short trip south this weekend for our annual winter "MTB Winter Training Camp". Not many better places around here to ride than Arkansas, especially in the winter. Christopher just picked up a new Giant Anthem X29 from The Wheel Cyclery. He has abused my old Anthem 26er for the past year and it was time for him to get his own rig. He absolutely loved it which was painful for me. I honestly could not keep up with him on the up hills and when things got really technical. He wasted no time in testing to see if it would hold up to his abuse. He hit every drop off Slaughter Pen had to offer. Me, I took the Sally line most of the time around these drop offs. It is very funny to him that I will not ride off and/or jump my bicycle, but will jump just about anything or drop down near vertical wall on my motorcycle. I do not understand it either. All I can say is I feel in control on a motorcycle. Saturday was spent riding Slaughter Pen. We got in several hours of great training for our first big MTB test of 2013 - The Ouachita Challenge. 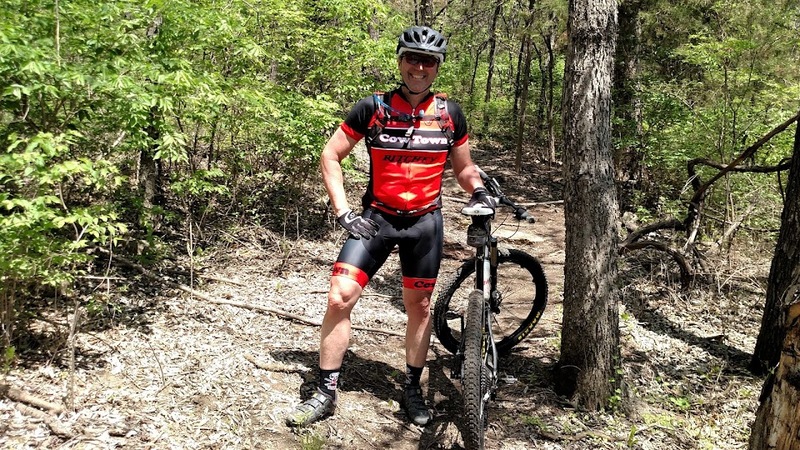 At the suggestion of my friend Tim Greene, we headed to the Blowing Springs Mountain Bike Trails on Sunday. What a great trail system. The trail has great views and a wide variety of terrain. Carolynn had a blast and rode well the entire weekend. We might have to sign her up for the OC instead of having her work the sag crew. If you are ever down in Bella Vista, AR, be sure to hit the Blowing Springs trails. We plan to ride them again in April on the way down to Oden. Here is the complete Slaughter Pen and Blowing Springs photo album. The 2nd Annual God's Country Off-Road Duathlon was a huge success. With over 150 racers this year. Everyone enjoyed the cool weather, fun course and great food. In the short course, Tim Fisher opened up a large lead on the first trail run. Chris Locke, riding a single speed, used his knowledge of the Lawrence River Trails to close to within seconds of the leader. Both were in the transition together and stayed close on the run until Fisher used his good running form to take the win.....On the women's side, Jean Lucas used her strong biking skills to open up a large lead on Dawn Clements. Dawn was able to close it down to within 30 seconds at the end. In the long course, the fastest time of the day was turned in by the male relay team of Bill Marshall & Lance Sulzen. They were closely followed by the overall men's winner Tige Lamb. Lamb easily won today's event over Nicholas Baldwin. Glenda Taylor makes it two years in a row. Taylor, who also is a masters racers, used her cycling fitness to her advantage to win over Laura Cheek. Cheek ended with second overall - 1st 30 - 39 Female.